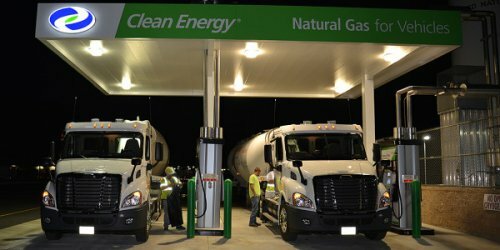 First 12L natural gas powered big trucks enter service in Georgia - What is the future of trucking? The first full-sized, full-powered, 12-liter heavy-duty trucking engines powered by pure natural gas to be commercially produced are now in service in Georgia. And you can expect to see many more of them in the near future. Modern Transportation, a Pennsylvania-based fleet operations company, has purchased and put into service two natural gas-powered Freightliner Cascadia trucks in Georgia. The trucks will carry supplies from Sanford, North Carolina to Owens Corning's roofing plant in Savannah, Georgia. This marks a new era in commercial transportation. While natural gas engines are nothing new in lighter-duty commercial vehicles, such as buses, some construction vehicles, and trucks of 16,000 gross vehicle weight (GVW) and lower, they are relatively new to the heavy-hauling, full-sized semi-truck sector. Cummins-Westport, one of the world's largest heavy-duty engine makers, has built natural gas engines for some time. Last year, they began offering a spark-ignited 11.9-liter dedicated natural gas engine, the ISX12 G, to truck makers. The engine has been adopted by several major truck manufacturers, including Freightliner, Paccar (Kenworth and Peterbilt brands), Mack and others. Among the first full-sized, commercial semi-trucks to roll off the line with the engines in them were Freightliner Cascadias, two of which were purchased by Modern Transportation. Until the 12-liter Cummins was available, the largest natural gas engine produced for road-legal commercial vehicles was a 9-liter, which while capable in smaller trucks or vehicles that don't carry heavy tonnage, was inadequate for over-the-road heavy hauling in Class 8 trucks with GVWs of 80,000 pounds. Vehicles of this size typically use diesel engines outputting about 450 horsepower. Today's diesels, however, are choked and made less reliable (according to a JD Power study in 2012) by expensive after-treatment and exhaust scrubbing technologies that inhibit their performance. Often, these engines lose 20-25 horsepower because of the government mandated scrubbing. This puts the 400 hp natural gas engine on par with them performance-wise, given the HP rating and comparable torque values. Compared to diesel, heavy-duty natural gas engines have several advantages as well as disadvantages. While fueling infrastructure, or a lack thereof, may seem to be the chief disadvantage, it's actually not. Commercial fleets on dedicated runs, the most likely to adopt natural gas, usually have their own or have contracted with others to provide the NG fuel. In the case of Modern Transport, their contract is with Clean Energy, which has a fueling station in Latta, South Carolina - these trucks are utilizing liquefied natural gas, or LNG. The primary disadvantage for NG-powered trucks is actually power and range. Natural gas is most comparable to gasoline in terms of power output per gallon equivalent. Diesel fuel is relatively power dense, which is why most diesel-powered vehicles get excellent fuel economy when compared to a standard gasoline vehicle. In trucking, while 7 mpg may not seem impressive to the average car owner, in an apples-to-apples comparison of weight carried per mile per gallon of fuel used, the average big truck on the road at 7 mpg is getting the equivalent of 124 mpg were it a passenger vehicle. Further, because NG is closer to gasoline in energy density, it has a shorter range than does diesel fuel. The gas-powered trucks being fielded in Georgia have a range of about 600 miles per fill up. That's just over half of the range of the average semi-truck (per fillup), which is around 1,100 miles. Of course, natural gas has the advantage of having an average fuel cost of about half that of diesel (per gallon equivalent), so the fuel cost for the range is about the same. One chief advantage of natural gas engines over diesel in freight hauling is that the equivalent NG engine requires little or no after-treatment to meet all federal and state requirements for emissions. Thus the engine is (theoretically) more reliable and less costly to maintain than its diesel counterpart. Of course, until these have been on the road for several years, that will not be known for sure. For its part, Cummins-Westport is guaranteeing their ISX-series of engines with the same warranties offered for an equivalent diesel powerplant. Will natural gas be the future of trucking? Perhaps, but probably not entirely. Like any other transportation sector, commercial transport has several markets and needs. For predictable, long-range trucking, natural gas is a great solution. It's far less expensive than electrification, readily available, and relatively cheap compared to the standard (diesel). For long haul (over the road, nationwide), however, it's disadvantages in terms of power output, range, and fueling infrastructure become problematic and are not likely to change anytime soon. Natural gas is, however, a proven and well-understood booster to diesel engines that can improve power output, fuel economy, and more at only a relatively small price increase. We can expect to see natural gas options for commercial trucking become much more commonplace in the near future. It is not likely, however, that we'll see a large portion of the diesel trucks currently on the roads replaced by natural gas anytime soon. For now, diesel remains the best option for commercial hauling in most scenarios and will remain so for the foreseeable future.